Welcome to the six hundred and seventeenth of my blog interviews with novelists, poets, short story authors, biographers, agents, publishers and more. Today’s is with short story and novella author, and editor Paul D Brazill. A list of interviewees (blogged and scheduled) can be found here. If you like what you read, please do go and investigate further. Morgen: Hello, Paul. Please tell us something about yourself, where you’re based, and how you came to be a writer. Paul: Hi Morgen, I’m Paul D. Brazill and I live in Poland. I started dabbling with writing flash fiction at the end of 2008 when I sent pieces to a few online e-zines, notably Six Sentences, Powder Burn Flash and A Twist Of Noir. And things have trundled along quite haphazardly since then. Morgen: Most authors write novels, what made you choose short stories? Paul: Because I know how easily I lose interest in things. I started off writing something that I would actually finish, so the shorter the form the better! Hence, flash! The stories are getting longer, quite naturally, but hopefully they’re still lean and mean! I hate flabby writing. Morgen: And readers do too. I love flash fiction too (part of the reason why I started Flash Fiction Fridays) and most of my 5pm Fiction is less than 500 words. Is there a genre that you generally write and have you considered other genres? But I think my stories are just a smorgasbord of the ‘stuff’ that clutters up my noggin. Morgen: 🙂 Me too, although I’m usually darker than light. Is there a particular market you aim for when writing stories for publication? Paul: Not really. I normally just write them and see where I think they can fit, or the story is commissioned. That makes it easier. Morgen: It would be, like themed competitions. They get me writing new pieces then if I don’t get anywhere I still have them to do something else with. Are there any publications you can recommend for short stories (submissions and reading)? Paul: It depends what kind of thing you write but Noir Nation (http://www.amazon.co.uk/Noir-Nation-International-Journal-ebook/dp/B005JTMIPW) is a certainly very classy magazine for those that like a shot of the dark stuff. And anyone else who has published me, of course! Morgen: Of course. 🙂 Why do think short stories are so hard done by (with most readers going for novels)? Paul: Oh, it’s just marketing. People have an instinct toward quantity over quality and big thick books can give the impression of having loads of ideas, even though they’re rarely Proust, are they? Also, with short stuff, every line counts, but most people skip like to zoom through a piece of writing to see what happens next. Morgen: I do, especially if there’s a heavy piece of description. I love being able to read a story in one go, anything less than an hour is a bonus. Can you remember the word count of shortest story you’ve ever written? You can also find a few on my website – as well as a couple of 6 word stories, 100-word stories – under the Snifters section on http://pauldbrazill.wordpress.com/blog. Morgen: I love trying 6-worders. Ernest Hemingway’s ‘For Sale: Baby Shoes, Never Worn’ has definitely put them on the map. You mentioned some of your published stories, have you had anything else published? Do you write under a pseudonym? Paul: I’ve had bits and bobs published in various magazines and anthologies, including CrimeFactory, Beat To A Pulp, Needle, Pulp Ink, A Twist Of Noir, and Noir Nation and The Mammoth Book Of Best British Crime 8 and 10. 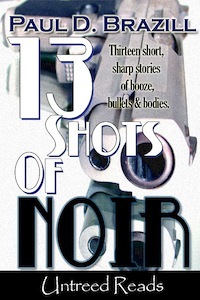 I’ve also had two short but perfectly formed eBook collections published –13 Shots Of Noir (Untreed Reads) and Snapshots (Pulp Metal Fiction). 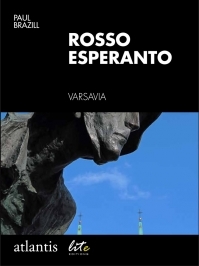 Also available as eBooks, are Rosso Esperanto (Atlantis), a novelette set in Warsaw and translated into Italian, and Vin Of Venus (Beat To A Pulp) written with David Cranmer and Garnett Elliot. 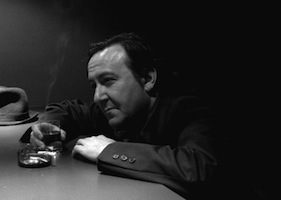 The novellas Guns Of Brixton and The Gumshoe will be published in 2012. Oh, I’ve also edited two anthologies – True Brit Grit – with Luca Veste – (Guilty Conscience) and Drunk On The Moon (Dark Valentine Press). Morgen: 🙂 They sound like great outlets, I’ve added them to https://morgenbailey.wordpress.com/submission-information/submissions-flash-fiction-short-stories. You’ve mentioned that some of your stories are available as eBooks. How involved were you in that process? Do you read eBooks (novels or short stories?) or is it paper all the way? Paul: Most of my stuff is available as eBooks, though you can get the two anthologies in paperback. I do most of my reading on my Kindle now. It’s a very purist form because it’s such an ugly device you have to be genuinely interested in the writing and not the packaging to bother. I know some people like to carry paper books or display them in bookcases because they don’t have a personality but I don’t need to worry about that. That said, some books have such great covers that it’s nice to have them as a bit of home decoration. The paperback of Drunk On The Moon is very tasty, for instance. Hint, hint. Morgen: 🙂 It is, very. Do you have a favourite of your stories or characters? If any of your stories were made into films (Annie Proulx’s Brokeback Mountain originated as a short story), who would you have as the leading actor/s? 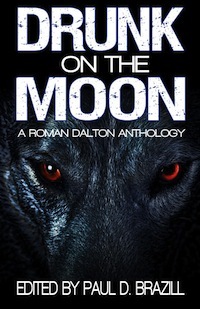 Paul: I’m getting more and more attached to the world of Drunk On The Moon – the story of a werewolf private detective – especially since other writers have put their own spin on those characters. There’s a richness there. Most of the actors I would choose to be in a Drunk On The Moon film are dead – like Olly Reed – because most of the young actors these days are far too squeaky clean for my liking. Morgen: He was a character. Is there an author that you would compare your writing to? Paul: The writer Keith Rawson once called me ‘The Noir Bukowski’, which was very flattering as I enjoy Bukowski very much. But, I think I’m more like Damon Runyon – if he’d grown up working class in the north east of England! With more swearing then. And Wetherspoons pubs. Morgen: I’ve heard of Charles Bukowski and Damon Runyon but am not familiar with their writing. I would be flattered to be compared to any established writer, especially one who’s listed on Wikipedia. 🙂 What are you working on at the moment / next? Paul: I’ve just finished a story for K A Laity’s Weirdo Noir anthology called Black Moon Rising. I’m tidying up my novella The Gumshoe, putting together a second Drunk On The Moon anthology, getting some of my stories translated into a couple of languages… and I’m sure there are some other things that I’ve forgotten about. Morgen: <laughs> Sounds like enough to keep you busy. Do you plot your stories or do you just get an idea and run with it? Paul: I wing it, like I do pretty much everything else in my life. Nietzsche said that ‘A man without a plan is not a man,’ but he was as batty as a cave full of guano, so I wouldn’t listen to him. Morgen: “a cave full of guano” – I love that. Do you do a lot of editing or do you find that as time goes on your writing is more fully-formed? Paul: I edit as I go along. Always. That keeps the mood. Mood is a priority. Then I do a couple of tidy ups and it’s Hiroshima Mon Amour! Morgen: I’m pretty much the same with my short pieces. The opposite is true for my novels; it’s taken me three years to get The Serial Dater’s Shopping List online, although it’s my longest novel, at 101,000 words. Many of my shorts are barely over 101. 🙂 Do you have an agent? Do you think they’re vital to an author’s success? Morgen: <laughs> How much marketing do you do? Paul: I play around on the internet for fun n frolics and that acts as marketing. There is no strategy, nothing is thought out. That’s not my way. Morgen: It’s tricky to know what works so frolicking may be the answer. What’s your favourite / least favourite aspect of your writing life? Has anything surprised you? Paul: I always thought that writers would be preposterous, pompous, pretentious and lots of other p- adjectives but most of the ones I’ve encountered online – especially the writers of really dark stuff – have been far from that. For a most part, it seems as if crime writers in particular are a cracking bunch. Morgen: The ones I’ve met certainly have been – in fact a few of us are meeting up at Graham Smith’s Crime writing weekend in March. What advice would you give aspiring writers? Paul: Never give or take advice. Especially well intentioned advice. Morgen: Perhaps wise. Is there a word, phrase or quote you like? Paul: ‘It’s all been rather lovely,’ the last words of John Le Mesurier. Morgen: What a great thing to say. Weighing up my life so far, I’d like to think I could say the same. Are you involved in anything else writing-related other than actual writing or marketing of your writing? I’m a member of International Thriller Writers Inc.
Morgen: I love the title ‘I Didn’t Say That, Did I?’. 🙂 Are there any writing-related websites and / or books that you find useful? Jason poured himself another glass of Burgundy and tried to flush Jenna from his thoughts. The bloated, red moon glared at him from the claret coloured sky as he headed towards oblivion like dirty dishwater down a plughole. And then, the sea of sleep enfolded him. Dark dreams and worse memories lapped at the shore of his slumber until he awoke, drowning in crimson. Slices of sunlight cut through the blinds and slashed across his eyes, stinging like a knife blade. Outside, seagulls screeched and cackled through the roaring wind as Jason closed his eyes and dissolved back into the night, resolving to never again drink red wine in bed. Paul D. Brazill was born in England and lives in Poland. He has had stories published in various magazines and anthologies, including The Mammoth Book Of Best British Crime 2011 and 2013. He has also published – 13 Shots Of Noir and Snapshots as well as the novelette Red Esperanto, which is published as Rosso Esperanto in Italy. He has edited two anthologies – True Brit Grit and Drunk On The Moon.